Reaching for Resources — Educate! | Preparing youth in Africa with the skills to succeed in today’s economy. In the eastern part of Uganda lies Mbale High School. The school has few books and limited space to serve its 1200 students. The teachers too are scarce, staying in school for only the hours they are in class. This is where Kenneth Whakhabembe attends secondary school, and despite the poor facilities, he has made great use of what’s available to him. He became an Educate! Scholar last year, and has since showed his school just how far their resources can go. Kenneth says that becoming an Educate! Scholar was an eye-opener for him. Despite the circumstances at Mbale High School, three weeks into the course Kenneth encouraged the other Educate! Scholars to stop looking down on themselves and instead find solutions to their challenges. Having to go without lunch, not being able to pay their school fees on time, and being part of a poor school filled the students with self pity. After learning the Educate! lesson on resourcefulness, though, Kenneth organized his Educate! Social Entrepreneurship Club to use their community’s resources to create opportunities. The Educate! 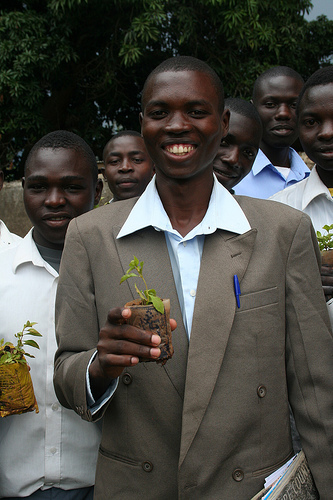 Scholars at Mbale High School started a nursery project. Their Social Entrepreneurship Club received a donation of small polythene water bags where they put manure and soil. They later collected cuttings (flower stems) that they placed in the bags. They fundraised among themselves and bought flower seedlings to plant in the remaining bags. They found that the stagnant water, which runs from the tap in the middle of the school compound, provided an excellent irrigation source for their nursery. They use it to water their flower beds every day. After only a few months the Mbale students had flowers to sell for profit. Their work was soon recognized by the school administration, which provided a ready market for their flowers. The Scholars were able to use the flowers they had grown to beautify the school compound, in addition to earning a profit. The Scholars, led by their Educate! Social Entrepreneurship Club president Kenneth, plan to reinvest their profits in a second project. What an impact for these students, who often go without lunch because of lack of money. Kenneth has led his Educate! peers not only through the completion of an income generating project, but also into a greater sense of self confidence and a restored belief in opportunity. In addition, last year Kenneth was elected president of his student government. He credits this to the public speaking and confidence skills he acquired through Educate!. When Kenneth is not working with the Mbale Educate! Social Entrepreneurship Club or serving as student government president, he spends his free time creating personal businesses. Over the December holidays Kenneth started a flower business in his home village and earned enough money to pay his school fees for his second term. He has also started a brick making business and is planning to teach other people, especially the youth in his community, the brick making skills he knows. Kenneth wants to be an engineer in the future and he believes that life and change are inseparable. When asked about advice he would give to the upcoming Educate! Scholars he replied, “Everybody has to ensure that they use the potential within them to positively change their communities.” Looks like he’ll be a great role model!